The roll out of the National Broadband Network (NBN) has impacted Telstra's net profit after tax (NPAT), which dropped 28 per cent to $1.2 billion in the half year ended 31 December 2018. Excluding the NBN and in the context of current market dynamics, Telstra’s underlying business performed well, the company told shareholders. "Telstra’s circumstances today are very different from what they were before the NBN. We are no longer the national wholesale provider. That part of our business – the revenue and value – is being transferred to the NBN and that is reflected in our income, profit, and dividends," Telstra CEO Andrew Penn explained. In the first half of the 2019 financial year, Telstra added 239,000 additional retail postpaid mobile services and Telstra Wholesale added 125,000 mobile services that were a mix of prepaid and postpaid. Its internet of things (IoT) business also saw revenue growth of 35.6 per cent, which helped drive revenue from mobile up 2.4 per cent compared to previous corresponding period. Telstra's revenue for the period was $12.6 billion, 1.7 per cent drop from last year's $12.8 billion. On the staff numbers side, 3,200 people have left Telstra, as part of the company's plans to eliminate 8,000 roles by 2022. According to the telco this includes more than 1,500 management and executive roles. The cost reductions of this workforce change are expected to flow into 2H19 and FY20. Penn said that despite the "challenges" faced by the business there are positive signs "particularly with the significant increase in retail post-paid mobile services". “Importantly, we remain very positive about Telstra’s prospects for the future," Penn said. "Demand for telco products and services continues to grow and telecommunications infrastructure is only going to increase in importance over the next decade. "With the onset of 5G, we expect to see positive ARPU influences across the industry from uptake and new services as we have with other new Gs. We also hope there will be some improvement in NBN wholesale prices." In January, Telstra revealed it had closed exclusive 5G deals with some of the "world's biggest brands", which would see it deliver exclusive access to 5G commercial smartphones in the first half of 2019. Penn said the company's T22 strategy was announced as a response to the impacts of the NBN roll out on the telco. Some of the results of the strategy include almost half a million mobile customers on the Peace of Mind data plans, which prevents customers to get excess data charges. “Telstra’s small business customers are benefiting from new bundles launched in October and Telstra Platinum for Business, a new prioritised IT and support solution, launched in November. These new solutions provide flexibility for businesses to scale and choose what is right for them," he continued. 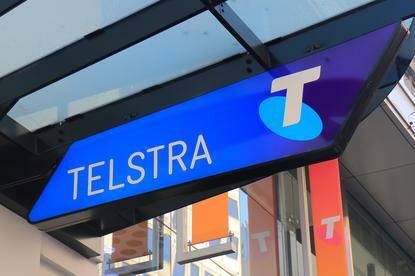 Telstra Enterprise, which covers sales and contract management for medium and large business and government generated $3.9 billion in income, however, domestically income was "broadly flat". Telstra expects to close 2019 with total income of $26.2 - $28.1 billion and EBITDA (excluding restructuring costs) of $8.7 to 9.4 billion.